Frank Jiang joined CStone Pharmaceuticals in July, 2016 as CEO. CStone is a biotech company focused on addressing the most important patient needs in China through its world class R&D team, innovative portfolio, and innovation strategy.Prior to CStone, Dr. Jiang joined Sanofi China in 2006 and built up its clinical research capabilities. In 2010, Dr. Jiang was promoted to Head of Asia Pacific R&D (including Japan) for Sanofi and responsible for developing and implementing regional R&D strategies to meet the emerging needs of patients in the APAC region.Prior to Sanofi China, Dr. Jiang was with Sanofi US, headed several global multiregional clinical trials.Prior to Sanofi, Dr. Jiang was at Eli Lilly and led a global Phase II trial with an anti-inflammatory agent for the treatment of patients with severe sepsis. 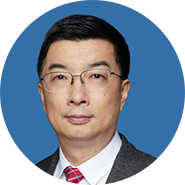 Dr. Jiang received his MD from Nanjing Medical University and PhD in Immunology from the University of British Columbia. He completed a clinical residency in Internal Medicine and a fellowship in Laboratory Medicine at Washington University School of Medicine.